We've organized 18 regular sessions, 3 student sessions and 2 panels. Thanks to Chris Dumas (UNCW) and Elaine Frey (CSU-LB) for serving on the organization "committee". We do this one every few years or so. Here is my post from 2014: "And, But, Therefore (SEA meeting mini-debrief)". Note that I'll be heavily borrowing from Glenn Blomquist's 2014 presentation this year. I think the idea is what do you say in class when the only policy idea is Washington, DC is deregulation sans benefit-cost analysis (and climate change is a hoax)? Here is the link to the entire AERE program: https://www.southerneconomic.org/current-year-program/?conferenceId=3&organizationId=2. When the Super Bowl comes to town hotels increase prices for rooms. Bars increase prices for drinks. Restaurants increase prices for food. So why when the Super Bowl of hurricanes comes to town would we expect anything less? When they checked rates online as Hurricane Harvey was strengthening and about to make landfall in Texas, a room with two queen beds was between $120 and $149 a night. But when a KXAN TV crew from Austin showed up on Saturday to get a room at that same hotel—a Robstown, Texas Best Western Plus, 20 miles from Corpus Christi—the clerk at the front desk quoted a price nearly triple what the crew had seen online: a staggering $321.89 a night, according to KXAN. The TV crew cried foul, and pushed back against the price. Eventually, the clerk admitted the room rates were much higher than usual. “Weekends start at $149, sometimes we start at $189,” the clerk told KXAN. “But, why is it so much?” KXAN reporter Wes Rapaport asked of the $321.89 charge. Why? Econ 101: That's why! When demand increases, prices rise. It's that simple. Without an increase in prices there would be a shortage (the quantity demanded would be greater than the quantity supplied). The price serves a function: to ration scarce goods. As goods become more scarce, the price rises to alleviate the shortage. I get it...higher prices are unpopular. And higher prices during times of need give us all an icky feeling. But consider the alternative: prices don't rise. If prices don't we need to find another way to allocate an increasingly scarce resource. Shortages lead to tensions and tensions lead to bad outcomes (think doorbuster sales on Black Friday). Rising prices during natural disasters are the worst outcome...except for all of the other outcomes. How else should we allocate scarce resources other than allowing prices to ration the goods? It always strikes me as disingenuous when authorities, concerned with perceptions, step in with superficial solutions. Hotels aren’t the only ones guilty of price gouging as Houston grapples with continued rainfall and flooding from Hurricane Harvey, the most powerful storm to hit Texas in more than 50 years. Over the weekend, more than 500 complaints of price gouging were lodged with the Texas attorney general’s office, according to CNBC—including $99 cases of bottled water, gas at $10 a gallon and hotels tripled or quadrupled in price. "These are things you can't do in Texas," Texas Attorney General Ken Paxton told CNBC in an interview Monday. "There are significant penalties if you price gouge in a crisis like this." Rather than grandstanding how about we address the real issue and find ways to increase supply more quickly--which will hold prices down, increase the number of people served and reduce tensions. A focus on rapid response and readiness will benefit far more people than legislating against markets. Devastating Hurricane Harvey, unprecedented in its rainfall, could be a slight negative for U.S. growth in the third quarter, but economists say it may ultimately provide a tiny boost to the national economy because of the rebuilding in the Houston area. Goldman Sachs economists estimate a very preliminary impact of the storm to be $30 billion in property damages, making it the ninth largest since World War II in terms of domestic property damage. Goldman economists say, in a note, the storm could take 0.2 points off of growth in third quarter because of the impact to the energy sector. The Goldman economists said the overall impact of the hurricane on second-half growth is uncertain because the negative effects will likely be offset by an increase in business investment and construction activity. There are also some ways the storm could spark a rise in inflation, which has been surprisingly weak this year. In Houston's case, the storm's impact on the refining sector and gasoline prices could spark inflation, said Swonk. Inflation slowed down this year and is a point of concern to the Federal Reserve, which would like to see more before it raises interest rates later in the year. Another reason Houston could generate a little inflation is because it's already facing a shortage of construction workers, and if the massive rebuilding effort attracts workers from other states, that shortage could go national, Swonk said. The competition for workers could lead to higher wages. Another temporary blip in inflation and a boost in consumption could come from car sales. Car prices, for new and used models, have been falling but an expected a surge in demand to replace vehicles lost in flood waters could result in an increase in prices, particularly for used cars. There could also be a pickup in building materials sales and possibly prices, with lumber already rising because of the new U.S. tariffs on Canadian soft lumber, Swonk said. However, any pickup in inflation could also be offset by a decline in inflation, due to the Amazon and Whole Foods merger. Amazon already cut prices at the grocery chain on its first day of ownership. I'm skeptical that Hurricane Harvey will contribute to inflation. Every increase in gas prices is not a 1970s style oil shock and the Amazon and Whole Foods merger ... wait, does someone really think that will put downward pressure on the overall price level in the U.S. economy? And if you want to donate to the relief effort here is one option at the American Red Cross. "If 99 doctors told you you had cancer, and one didn't, who would you believe?" Overheard while sitting in a waiting room this morning. Source was a Vietnam Veteran (he was wearing a hat that said so), talking to his wife about global warming (I have no idea why). A New York Times op ed discusses research on what Exxon knew about climate change and when. Guess what? They knew and didn't admit it publicly*. The Interagency Working Group has already provided the social cost of carbon estimate using "the best available science and economics"
The social cost of greenhouse gases should be regularly updated, especially to reflect the latest evidence about damage functions (10). Meanwhile, government and private sector analysts should continue using IWG's central estimate of $50 per ton of carbon dioxide with confidence that it is still the best estimate of the social cost of greenhouse gases. Here is a summary of the best available science and economics: Greenstone et al., REEP (2013). Under the generous support of the Harold C. Troxler Endowment, John C. Whitehead will be the inaugural Troxler Visiting Distinguished Professor of Economics this year. (https://economics.appstate.edu/faculty-staff/john-whitehead-phd) Dr. Whitehead is a highly regarded scholar in Environmental and Natural Resource Economics. He began his academic career as an Assistant Professor at ECU in 1989 and served as Director of the Coastal and Marine Studies Program for five years and advanced to Professor of Economics before moving to UNC-Wilmington and then Appalachian State University. He is a prolific writer having published over 100 refereed journal articles. Dr. Whitehead will be conducting collaborative research with researchers on campus, mentoring junior faculty’s research, and providing guest lectures to our students. Desvousges, Mathews and Train (2015) find that their contingent valuation method (CVM) survey data does not pass the adding up test using a nonparametric estimate of mean willingnessto-pay. Their data suffers from non-monotocity, flat bid curve and fat tails problems, each of which can cause willingness-to-pay estimates to be sensitive to the approach chosen to measure the central tendency. Using additional parametric approaches that are standard in the literature, I find that willingness to pay for the whole is not statistically different from the sum of the parts in two of three additional estimates. In additional robustness checks, all six of the additional tests find that the WTP estimates do not reject the adding up hypothesis. The negative result in Desvousges, Mathews and Train (2015) is not robust to these alternative approaches to willingness-to-pay estimation. ... is an online-only journal dedicated to publishing high quality original research across all areas of economics. It views academic publishing as a cooperative enterprise between authors, editors, referees, and readers. Replications are an important public good to the economics community, and as such, they tend to be under-valued. By opening a replications section in our open access, open assessment journal, we hope to make it easier for authors to provide this important public good. The author submits a paper, if possible with hyperlinks to the referenced literature. In addition to the paper, the author is encouraged to also provide mathematical derivations, underlying data sets and a list of researchers who may be interested in reviewing and rating the paper. The assistant editors check formal and professional standards and pass the paper to a co-editor in the relevant research field. The co-editor decides on whether to accept the paper for the further peer review process by answering two questions: (i) Whether the paper shows promise of making a significant contribution and (ii) whether it meets basic scientific standards. The co-editor is free to ask other experts in the field for a quick opinion. The co-editor appoints at least two referees for reviewing the paper .... The referee reports are uploaded on the discussion paper platform within six weeks if possible. The referees’ comments may be anonymous, but referees are encouraged to allow their reports to be attributed. Referees are asked to provide short reports that focus on two questions: (i) Is the contribution of the paper potentially significant? (ii) Is the analysis correct? Referees are asked NOT to rewrite the paper or to change its focus. With their assignment thus circumscribed, the referees can be expected to provide reports before the six week deadline elapses. During the discussion period, the editorial staff sends the paper to potentially interested researchers (invited readers) to encourage them to also post a comment on the discussion platform. The list of these researchers is compiled partly by the managing staff with the help of the Leibniz Information Centre for Economics and partly by the author. The author is free to respond to all comments. 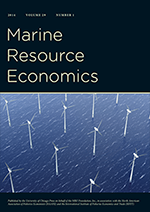 Based on the referee reports, the comments made by registered and invited readers and the author replies, the co-editor decides whether the paper is accepted or rejected for publication in Economics. If the co-editor´s decision deviates from the views of the referees and the registered readers, the co-editor is free to justify it publicly through a statement in the paper’s discussion forum. In the case of acceptance, the co-editor prepares a short statement, e.g. containing suggestion for revisions. If accepted, the discussion paper or its revised version is published as article in Economics. The discussion paper with all comments is permanently archived and remains accessible to the public for documenting the paper’s history. I anticipate that this will be a fascinating process and I'm sure to learn a lot.